Milk Protein (Calcium Caseinate, Milk Protein Isolate, Whey Protein Isolate), Chocolate (Maltitol, Cocoa Butter, Whole Milk Powder, Cocoa Mass, Emulsifier (Soy Lecithin), Natural Flavors), Polydextrose, Gelatine Hydrolysate, Glycerol, Soy Protein Isolate, Cocoa Butter, Soy Oil, Palm Fat, Xylitol, Sucralose, Skimmed Milk Powder, Fat Reduced Cocoa, Peanut, Tapioca Starch, Caramel Pieces (Sugar, Glucose, Syrup, Sweetened Condensed Milk, Salted Butter), Natural and Artificial Flavors, Emulsifier (Soy Lecithin). ALLERGEN WARNING: Contains Milk, Soy and Peanuts. Manufactured in a facility that also processes Gluten, Tree Nuts, Wheat and Eggs. Chocolate (Maltitol, Cacao Fat, Dry Whole Milk, Cocoa Mass, Lecithin, Natural Flavors), Protein Blend (Calcium Caseinate, Milk Protein Isolate, Whey Protein Isolate), Polydextrose, Gelatin, Glycerin, Soy Protein Isolate, Soy Bean Oil, Low Fat Cocoa, Nonfat Dry Milk, Xylitol, Sucralose, Tapioca Starch, Natural Flavors and Artificial Flavors, Salt, Sunflower Oil, Citric Acid Esters of Mono-and Diglycerides, Colored with Beta Carotene. 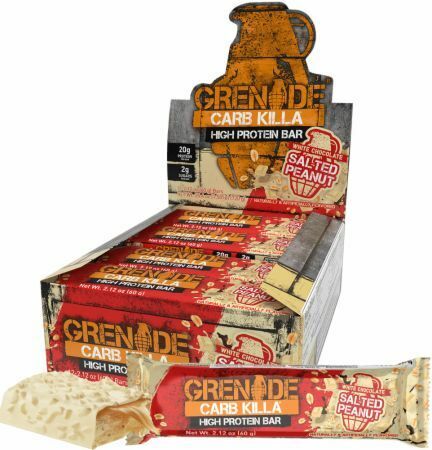 Grenade® Carb Killa should be consumed as part of a balanced diet. Product contains more than 10g/100g Polyols. Excessive consumption may product laxative effects. Keep out of reach of children. Store in a cool, dry place. Chocolate (Maltitol, Cocoa Fat, Dry Whole Milk, Cocoa Mass, Lecithin, Natural Flavors), Protein Blend (Calcium Caseinate, Milk Protein Isolate, Whey Protein Isolate), Gelatin, Polydextrose, Glycerin, Peanuts, Soy Oil, Nonfat Dry Milk, Xylitol, Natural Flavors And Artificial Flavors, Salt, Lecithin, Sucralose. White Chocolate (Maltitol, Cacao Fat, Dry Whole Milk, Lecithin, Vanilla Powder), Protein Blend (Calcium Caseinate, Milk Protein Isolate, Whey Protein Isolate), Polydextrose, Gelatin, Glycerin, Soy Protein Isolate, Soybean Oil, Palm Oil, Xylitol, Sucralose, Nonfat Dry Milk, Breakfast Cocoa, Dry Cream, Tapioca Starch, Salt, Citric Acid Esters of Mono- and Diglycerides, Vanilla Powder, Natural Flavors, Sunflower Oil, Colored with Beta Carotene, Colored with Titanium Dioxide. CONTAINS: Milk, Soy. Manufactured in a facility that also processes tree nuts, peanuts, wheat and eggs. Protein Blend (Calcium Caseinate, Whey Protein Isolate), White Chocolate Flavored Coating (Maltitol, Cocoa Butter, Whole Milk, Soy Lecithin, Vanilla Powder), Glycerin, Hydrolyzed Gelatin, Sugar Free Sprinkles (Maltitol, Potato Starch, Rice Flour, Palm Oil, Artificial Colors, Blue 1 Lake), Palm Oil, Isomalto-Oligosaccharide, Whey Protein Crisp (Whey Protein, Rice Flour, Soy Lecithin), Natural and Artificial Flavor, Sucralose. Protein Blend (Calcium Caseinate, Milk Protein Isolate, Whey Protein Isolate), Chocolate (Maltitol, Cacao Fat, Dry Whole Milk, Cocoa Mass, Lecithin, Natural And Artificial Flavors), Polydextrose, Gelatin, Glycerol, Soy Protein Isolate, Cacao Fat, Soybean Oil, Palm Oil, Xylitol, Sucralose, Nonfat Dry Milk, Low Fat Cocoa, Natural And Artificial Flavors, Tapioca Starch, Salt, Lecithin. Do not exceed the recommended daily dose. Those who are pregnant, nursing or taking medication are advised to consult a physician before use. Grenade® Carb Killa should be consumed as part of a balanced diet. Product contains more than 10g/100g Polyols. Excessive consumption may product laxative effects. Keep out of reach of children. Store in a cool, dry place. Peanuts, Salted Peanuts (Peanuts, Peanut Oil, Salt), Chicory Root Fiber, Soluble Vegetable Fiber, Vegetable Glycerin, Soy Protein Isolate, Rice Protein, Almond Flour, Soy Crisp (Soy Protein Isolate, Low Fat Cocoa, Tapioca Starch), Sunflower Oil, Chocolate Drops (Sugar, Cocoa Mass, Cocoa Butter, Lecithin, Natural Flavors), Maltodextrin, Acacia Gum, Salt, Cocoa Mass, Low Fat Cocoa, Natural Flavors. CONTAINS: Soy, Peanut, Almond and Sesame. Manufactured in a facility that also processes tree nuts, egg. The Go Nuts bar is the ultimate guilt-free snack to grab on the go, containing absolutely nuttin’ artificial. There are no artificial colors, flavors or sweeteners and it’s gluten free too! White Chocolate Cookie This is a Buy 1 Get 1 FREE offer! Peanut Nutter This is a Buy 1 Get 1 FREE offer!